Creative problem solving (CPS) is a way of solving problems or identifying opportunities when conventional thinking has failed. It encourages you to find fresh perspectives and come up with innovative solutions, so that you can formulate a plan to overcome obstacles and reach your goals. In this article, we'll explore what CPS is, and we'll look at its key principles. We'll also provide a model that you can use to generate creative solutions. Dealing with obstacles and challenges is a regular part of working life, and overcoming them isn't always easy. To improve your products, services, communications, and interpersonal skills, and for you and your organization to excel, you need to encourage creative thinking and find innovative solutions that work. CPS asks you to separate your "divergent" and "convergent" thinking as a way to do this. Divergent thinking is the process of generating lots of potential solutions and possibilities, otherwise known as brainstorming. And convergent thinking involves evaluating those options and choosing the most promising one. Often, we use a combination of the two to develop new ideas or solutions. However, using them simultaneously can result in unbalanced or biased decisions, and can stifle idea generation. Divergent and convergent thinking must be balanced. The key to creativity is learning how to identify and balance divergent and convergent thinking (done separately), and knowing when to practice each one. Ask problems as questions. When you rephrase problems and challenges as open-ended questions with multiple possibilities, it's easier to come up with solutions. Asking these types of questions generates lots of rich information, while asking closed questions tends to elicit short answers, such as confirmations or disagreements. Problem statements tend to generate limited responses, or none at all. Defer or suspend judgment. As Alex Osborn learned from his work on brainstorming, judging solutions early on tends to shut down idea generation. Instead, there's an appropriate and necessary time to judge ideas during the convergence stage. Focus on "Yes, and," rather than "No, but." Language matters when you're generating information and ideas. "Yes, and" encourages people to expand their thoughts, which is necessary during certain stages of CPS. Using the word "but" – preceded by "yes" or "no" – ends conversation, and often negates what's come before it. 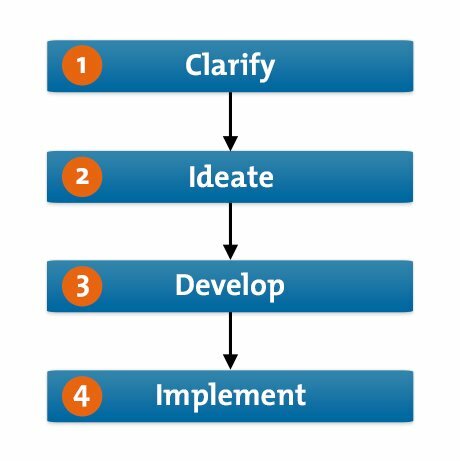 Let's explore how you can use each of the four steps of the CPS Learner's Model (shown in figure 1, below) to generate innovative ideas and solutions. Identify your goal, desire or challenge. This is a crucial first step because it's easy to assume, incorrectly, that you know what the problem is. However, you may have missed something or have failed to understand the issue fully, and defining your objective can provide clarity. Once you've identified and understood the problem, you can collect information about it and develop a clear understanding of it. Make a note of details such as who and what is involved, all the relevant facts, and everyone's feelings and opinions. When you've increased your awareness of the challenge or problem you've identified, ask questions that will generate solutions. Think about the obstacles you might face and the opportunities they could present. Generate ideas that answer the challenge questions you identified in step 1. It can be tempting to consider solutions that you've tried before, as our minds tend to return to habitual thinking patterns that stop us from producing new ideas. However, this is a chance to use your creativity. This is the convergent stage of CPS, where you begin to focus on evaluating all of your possible options and come up with solutions. Analyze whether potential solutions meet your needs and criteria, and decide whether you can implement them successfully. Next, consider how you can strengthen them and determine which ones are the best "fit." Once you've chosen the best solution, it's time to develop a plan of action. Start by identifying resources and actions that will allow you to implement your chosen solution. Next, communicate your plan and make sure that everyone involved understands and accepts it. Have you ever faced a problem that you thought was insurmountable? Perhaps your boss has asked you to reduce spending in your department, but you can't see where to make cuts without sacrificing quality. Try following the first step of the CPS process, and clearly identify the problem. Next, gather data and formulate the challenge. Then, you can explore ideas and come up with solutions. Finally, develop a plan of action and make your solution a reality.